EB is rare genetic connective tissue disorder that affects 1 child out of every 20,000 births (about 200 children a year are born with EB). There are estimates that approximately 50,000 people are affected by EB in the US (compare this to 400,000 people with Down Syndrome in the US or the 30 million people diagnosed with diabetes). There are 4 main types of EB: Simplex, Junction, Dystrophic, and Kindler Syndrome. Each type can be diagnosed by a genetic test or skin biopsy that shows which gene is affected. Kiira’s diagnosis is Recessive Dystrophic Epidermolysis Bullosa (RDEB), a genetic condition that causes the skin to be extremely fragile. 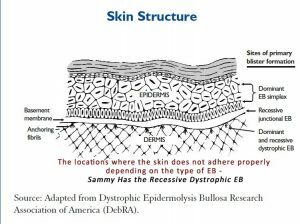 The incidence of all types of dystrophic epidermolysis bullosa is estimated to be 6.5 per million newborns in the United States. The severe autosomal recessive forms of this disorder affect fewer than 1 per million newborns. So, Kiira truly is 1 in a million! RDEB causes Kiira’s skin to blister or tear easily when she experiences friction or cuts in her skin. Her diagnosis was confirmed based on a skin biopsy and a genetic test that were conducted the day after she was born. We had no idea that we carried the mutations that caused Kiira’s condition, since it is recessive and we do not show any signs or symptoms of the condition. Kiira’s older sisters and our extended family also do not show any signs of EB. Unfortunately, there is no regular testing to detect carriers for RDEB, so we, like most other families who have RDEB children, don’t know we are carriers until our children are born. We also received a genetic test and the mutations present in our DNA match what they found in Kiira’s, so it is a confirmed diagnosis. Our other 2 daughters have a 50% chance of also being carriers, so when the time comes for them to plan a family, they may want to get tested and if they are carriers, their spouse will want to get tested as well. We all have mutations of some kind in our DNA. To test for all of these mutations before we have children would be impossible, so while it would be great to “force” the medical industry to test us for every little thing that could possibly go wrong, it’s not realistic. Unfortunately EB, as terrible as it is, it’s not common enough for it to be included in the regular testing done on a fetus, although it is possible. The tests showed that Kiira has 2 mutations in the COL7A1 gene, which is supposed to produce Collagen VII, a vital part of your skin’s ability to adhere one layer to the next. However, her mutations tell her proteins to stop forming, so Collagen VII is not present in her skin. The Collagen VII is an anchoring fibril that holds the epidermal basement membrane to the upper dermis. Without the fibrils, the skin is easily removed with the slightest friction. People can vary in severity, even when classified as a certain type, because other factors go into making your skin. In Kiira’s case, we have not found a person with the same 2 mutations she has, because there are over 500 mutations found that cause RDEB. This makes it extremely difficult to know what lies ahead for Kiira. She could encounter few, some, or all of the difficulties associated with RDEB, but we won’t know until we face them. Since there are too many what-ifs, we have to take it day-by-day. There are two major types of RDEB, although there are also a few other subtypes as well. Based on the clinical presence of Kiira’s skin, the geneticist classified her as non-severe, or non-Hallopeau-Siemens type. However, based on her genetic results, she would more likely be classified as severe, or RDEB-Hallopeau-Siemens type. 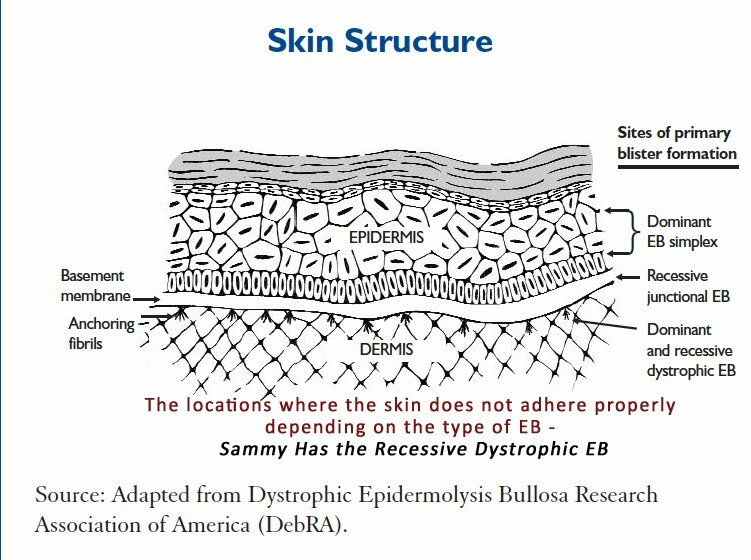 NIH describes RDEB-HS as follows: “Affected infants are typically born with widespread blistering and areas of missing skin, often caused by trauma during birth. Most often, blisters are present over the whole body and affect mucous membranes such as the moist lining of the mouth and digestive tract. As the blisters heal, they result in severe scarring. Scarring in the mouth and esophagus can make it difficult to chew and swallow food, leading to chronic malnutrition and slow growth. Additional complications of progressive scarring can include fusion of the fingers and toes, loss of fingernails and toenails, joint deformities (contractures) that restrict movement, and eye inflammation leading to vision loss. Additionally, young adults with the classic form of dystrophic epidermolysis bullosa have a very high risk of developing a form of skin cancer called squamous cell carcinoma, which tends to be unusually aggressive and is often life-threatening.” RDEB-non HS is less severe, but has similar effects. Typically the life expectancy is about 30 years old, if the child survives the first couple of years. However, medical treatments, better wrapping technique, and more knowledge, is likely to increase this lifespan and of course there are always those outliers who are still thriving in their 60’s. In addition to the medical side of EB, there is a big emotional component. Constantly dealing with pain and disfigurement, many people with EB struggle with depression and anxiety. The toll on families can be nearly as difficult–emotionally, financially, and more. Kiira seems to be somewhat less severe currently. She can wear a diaper and soft clothing without tags, often with seams turned inside out. We notice that when she gets cut, it sometimes blisters, but rarely do we have to pop those–they tend to go away on their own. However, when there is a large amount of friction she does blister. For example, a seam on her shirt that constantly rubs, picking her up from under arms (the weight of her body against our hands) or holding her fingers too tight during dressing changes, does cause blistering. We also pad her heels every day because she loves to kick her legs and the friction of her heel hitting anything creates a blister, which makes finding shoes very difficult, so she walks around in socks over her bandages. Kiira also has blisters in her mouth, but so far they have not affected her eating too much. As a newborn, we held Kiira using a blanket or pillow between us, but we would talk and sing to her, kiss her head gently, let her play on a mat or bouncer and bat at toys, and sometimes even her sisters get to hold her. Now, she is walking, climbing, eating solid foods, and doing everything she can to keep up with her older sisters. She has surpassed our expectations beyond our wildest dreams and I’m sure she will continue to do so. Clinically “She looks great!” according to the doctors, but genetically, we just don’t know what is to come.